The glorious Thanksgiving season is upon us and, to all of my US readers, I hope you have a wonderfully festive week. Even if you’re not celebrating T-day this week, keep reading because I’m convinced that Thanksgiving is, in fact, the perfect frugal holiday. I mean, the whole day is centered around a cornerstone of successful frugality: cooking at home! Unlike nearly every other holiday we mark throughout the year, there’s essentially nothing to buy for Thanksgiving except for food. How great, and tasty, is that! I mean, we can’t talk about Thanksgiving without discussing the food, am I right? When I hear backlash against this holiday’s meal to the effect that it encourages gluttony and overconsumption, I must heartily disagree! What I think Thanksgiving encourages are: LEFTOVERS! Quite possibly the greatest aspect of Thanksgiving are the massive quantities of leftover foodstuffs. Leftovers are a linchpin of frugality and smart, efficient cooking in general. Throwing out food is a terrible proposition for your time, your money, and the environment. Leftovers represent a great deal of embodied cost: you’ve already spent money on the ingredients and invested a fair amount of your time in preparing the meal. Why on earth would you then throw your labors down the drain? Or into the trash? The horror! Learning to love the leftover life will make you a happier frugal person and will cut down on your workload and your grocery budget. I can pretty much guarantee this. If you’re not a fan of eating the same food night after night, simply freeze whatever you don’t eat and defrost it for a future no-fuss meal (we call this “frugal take-out” because you just take it out of the freezer and eat it). Perfect. For the past five years, we’ve hosted Mr. Frugalwoods’ family at our home for Thanksgiving, which is a treat and a delight. I love having our home filled with family, not to mention the incredible smells of Mr. FW and his mother cooking up divine concoctions in our kitchen. I’d always thought of the Thanksgiving feast as a basic rota of a turkey, stuffing, cranberry sauce from a can, and a pumpkin pie. But this is not how it happens according to Mr. FW and his mother–they outdo themselves year after year with inventive recipes for everything from brussels sprouts to yams to things involving bacon (enough said). We feast on this spread for several days and then judiciously freeze everything that’s leftover. I gotta tell you, I am amazed at how many foods freeze well! I think our success might be due in part to our deep freeze (and probably also my low standards for food–my metric is: if I don’t have to cook it, I will eat it). But seriously, you can freeze just about anything! The full dessert rundown: Pies! And a pumpkin crisp cake! Shoo Fly Pie. A relic of my mother-in-law’s grandmother’s Pennsylvania Dutch roots, this unusual molasses-flavored pie is semi-sweet and best as a breakfast or afternoon coffee accompaniment (or if you’re me, perfect anytime you can get a piece). I will caution that this pie is not universally loved. We–the Frugalwoods clan–adore and adulate this pie, but I’ve served it to friends who politely tried to stomach it without much apparent glee. So be forewarned! Should you choose to bake this pie, I include the recipe–in my mother-in-law’s handwriting–in this post. Pecan Pie. I am actually not a huge fan of this pie, but it is ridiculously popular with my dad, my father-in-law, and Mr. FW. It’s also unbelievably easy to make, so I’m happy to oblige them every year. The recipe I use was originally my great aunt’s, although I think she got it off of a Karo syrup bottle because it bears a striking resemblance to this recipe. No matter, it’s a family favorite! Pumpkin Crisp Cake. The utilization of this recipe came about after a somewhat controversial realization that no one (except for me and my mom) like the pumpkin cheesecake pie that I grew up with on Thanksgiving. I know this because, in a zeal to feed my guests one year, I made four of them. And three of them went uneaten (ok they didn’t go uneaten forever, it’s just that no one ate them Thanksgiving week and so I took them into my office and, full disclosure, was personally responsible for the consumption of 2.5 of them… ). In the interest of meeting my guests’ tastes, several years ago I began employing a delectable pumpkin crisp recipe, which is way easier to make than pies and receives rave reviews from all parties. So, there you have it. This recipe is very close to what I make. Oh the glories of Thanksgiving feasts! This year we’re celebrating on a smaller scale as a cozy little family of 3.5 (plus Frugal Hound!). We visited my in-laws last month and they’re coming to–mercifully–help us when our second child is born in February. Given this, they decided to forgo their Thanksgiving trip this year. We’ll miss them terribly and in their absence, we’ll employ our own mini traditions. 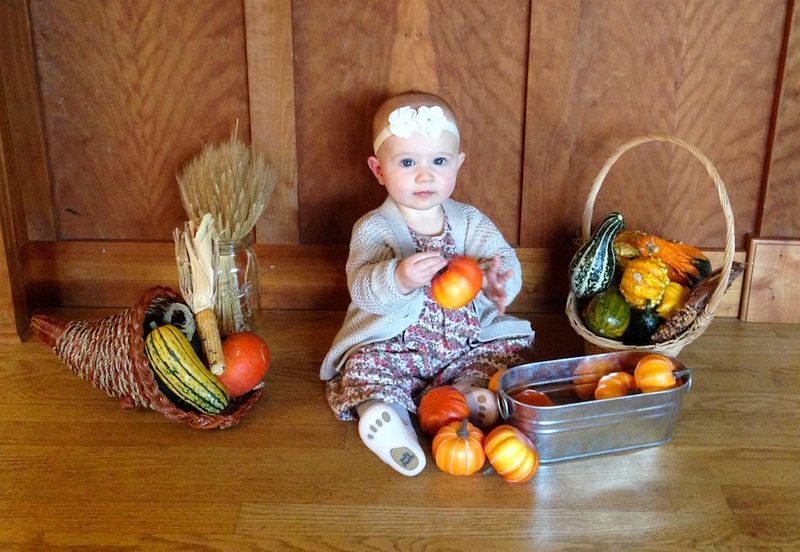 Two years ago, we had much the same Thanksgiving as we awaited our first child’s birth! Sage and Sausage Stuffing. This stuff is certifiably amazing. Here’s the recipe, and you’re welcome. You will not be disappointed. It really says something that this’ll be our main course as opposed to a turkey bird. Cranberry orange sauce. A recipe Mr. FW made up, this involves using real cranberries, orange peel, and bourbon. Biscuits. Full disclosure, you guys, we use canned biscuits. Try not to faint. Mr. FW made them from scratch one year and: 1) it took him forever. For-ev-er. and 2) they honestly didn’t taste as good as the ones from a can (sorry, Mr. FW)! One of our very few non-homemade food splurges, yep, it’s biscuits from a can. Something so simple, even I could probably handle popping open the can and arraying them on a baking sheet. But, let’s be honest, I won’t because it’s not my department. Cheese straws. Mr. FW first made these delectable little tidbits for his mother’s birthday this summer (which we celebrated at our house) and they were a resounding success. Our neighbor baked them awhile back and, overcome with love for them, Mr. FW sought out the recipe and gave it a try. They are beyond good and–according to my personal chef–not difficult to make. I’m not surprised as they’re a King Arthur Flour (KAF) recipe. KAF is my go-to for nearly all baking recipes. I’ve never made a bad KAF recipe. Doesn’t hurt that they’re a locally-owned Vermont cooperative and I met a woman once at a baby playgroup who designs and tests their recipes! I think she thought I was an unhinged fan based on how much I waxed on about her amazing recipes… They’re that good. Cinnamon rolls from scratch. This is a brand-new addition that Mr. FW decided to tackle this year, primarily as a result of my comments about the glories of cinnamon rolls (which I have yet to consume) during this pregnancy. To say I’m excited would be a gross understatement. I’m not sure what Mr. FW plans to eat as I’ll be taking care of these in their entirety. It’s telling that, here again, we’re employing a King Arthur Flour recipe (although I can’t personally testify for this particular recipe as we haven’t made it yet). Deviled Eggs. I don’t think these have anything to do with Thanksgiving, per se, but we really love them and we never have them outside of the holiday season. So, we’re having them! Shoo Fly Pie. I will, in fact, deign to enter the kitchen in order to bake Shoo Fly Pies as they are truly the landmark taste of Frugalwoods holidays. It just wouldn’t be right not to have one. Since my mother-in-law’s recipe makes two pies (and efficiency and all that), I’ll go ahead and bake both this week and then freeze one for Christmas. I’ve never frozen a Shoo Fly Pie before, so we’ll see how it goes. I’m optimistic/going to do it anyway. P.S. I’m using pre-made frozen pie crusts because I have a toddler, I’m pregnant, and I have a book coming out in March. Time-saving and all that. As you can see, this is nowhere near a traditional Thanksgiving menu, but it’s a menu of foods we love (carbs!!) that represent a major deviation from our normal kale/chard/garbanzo bean diet. It’s also, now that I look at, basically a bunch of side dishes and deserts, which is how we like to eat if given the chance. Lots to taste! I think the holidays are all about creating and enjoying special meals, so this menu sounds perfect to me. Also, I’m now starving and wondering when Mr. FW plans on making those cinnamon rolls… right about now seems like a good time. I heard a story on NPR this past weekend about the stress that many people feel over an imperative to create a perfect, sumptuous, traditional Thanksgiving feast, to which I say, why? Why make foods you don’t enjoy or don’t know how to cook? If your family loves spaghetti more than anything, why not have that? If your specialty is homemade Indian food, why not cook Chana Masala? Being an anti-stress, anti-pressure, anti-conformist person, I perish the thought of people fretting over a holiday meal. I mean truly, what is the point? There’s no law saying you must have a turkey and mashed potatoes on your table this Thursday. There’s no Thanksgiving police ready to fine you for not serving a pumpkin-themed dish. Do what you love and cook what works for you. Create a holiday you’ll enjoy, not one that you’ll stress out over. This is crucial to remember because I often find that when we’re stressed out about something, we ratchet up our spending. We start throwing money at a problem in a vain attempt to make it all better, which usually just ends up complicating the situation and throwing off our finances for the month. Perhaps I’m too laissez-faire about these things, but if a tradition causes you heartburn and makes you spend more money than you normally would, why do it? The holidays are meant to be fun, to be filled with delight, and to leave you with warm, lasting memories. Tearing your hair out in the kitchen for twelve hours straight is not in alignment with those goals. 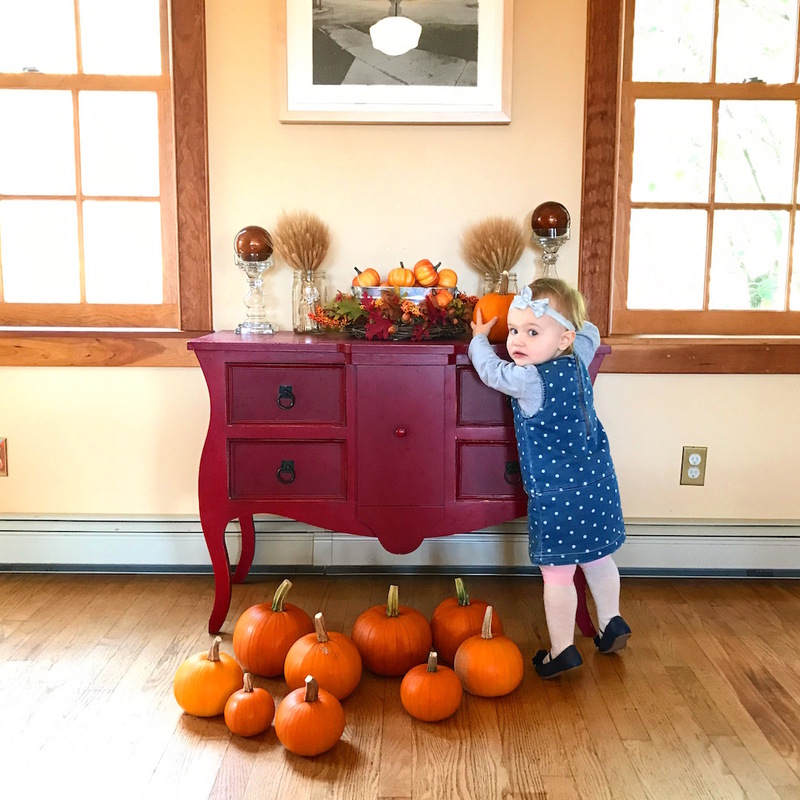 So I challenge you this year to let go of the drive for a perfect, Instagram-worthy Thanksgiving and instead create a holiday that’s peaceful, low-stress, and centered around time with family as opposed to time in the kitchen. Just channel me and my biscuits-from-a-can (which really are delicious, I’ve got to say… ) and frozen pie crusts. I feel as though I have a slightly deeper understanding of Thanksgiving now that we live on a homestead beholden to the natural world in a way that we never were back in our city days. The notion of celebrating the harvest, expressing gratitude that summer’s labors are over, and relishing the privilege of being inside a warm, snug house with plenty to eat is a more profound realization for us now that we grow some of our own food and heat our home with wood from our land. It’s a real seasonal imperative to hunker down inside and appreciate the fruits of our seasonal work. I’m on a quest to infuse gratitude into my daily life (results totally vary… ) and one of the ways I do this is by reflecting on how thankful I am for seemingly simple things that I used to take for granted. I am thankful that I live in a warm home, I am thankful that I have electricity and water, I am thankful for my health… it’s a pretty long list. By reminding myself that it’s entirely within my control to perceive that I’m surrounded by abundance as opposed to deprivation, I’m able to manifest contentment. I am not a perfectly grateful, zen person. I’m really impatient and also a recovering perfectionist (constantly in recovery… ). These attributes are not attractive and they do not help me to be gracious and loving. But this daily practice of listing things that are awesome about my life, and remembering that my happiness is largely within my control, does seem to be working. 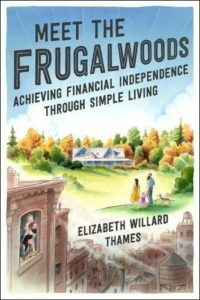 Mr. FW and I are profoundly privileged, a topic I’ve reflected on a number of times here on Frugalwoods, and I feel an imperative to keep this privilege top of mind. Something about parenting a small toddler has a way of chipping away at one’s inner peace and eroding the confidence and gratitude that I start the day with. By creating small bits of space for gratitude to creep in, I’m able to see the bigger picture of the interesting (stubborn), independent (willful), intelligent (talks non-stop) person my daughter is growing into, as opposed to dwelling on the frustrations of daily toddler existence (to whit, I’m writing this with a child literally clinging to my leg… ). One of the greatest gifts frugality has given me is the understanding of how much I have and how little I actually need in order to live the good life. Thanksgiving is a time when we’re prompted into gratitude and I think that’s a wonderful thing for a holiday to do. Rather than exerting a focus on gifts, or external metrics of happiness, or material wealth, Thanksgiving centers around the core things we value. Find space this week for this type of reflection, seek out quiet moments to list the things you’re thankful for (an exercise not just for kids! ), and meditate on gratitude. How will you celebrate Thanksgiving this year? 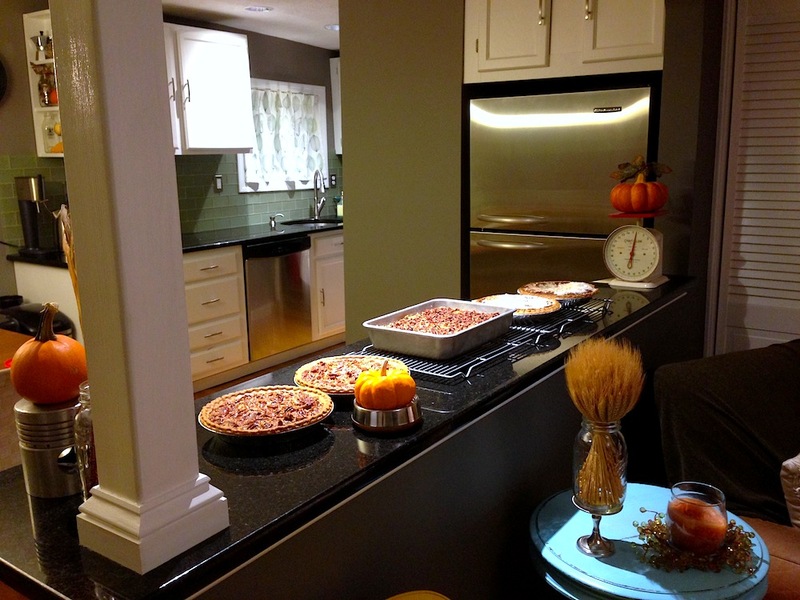 In what ways do frugality and simplicity inform your holiday? I love, love, love this post and its intentions. While we don’t celebrate Thanksgiving in Norway, there is always Christmas. Back before my parents divorced, Christmas dinner was a truly bonkers affair. There was the main meat, small sausages, meatballs, boiled potatoes, steamed carrots and peas, plus red cabbage, white cabbage and brussel sprouts (3 different species of cabbage in one meal, and each it’s own dish!). Plus, of course, sauce, lingonberry relish, mustard and pickles. All for no more than a family of five. It was ridiculous and absolutely unnecessary. All that stress you are talking about used to be me too. I am so glad that many family members are unabashedly making these big family meals a potluck, so the host can actually enjoy it. I used to slave for days before Thanksgiving and Christmas making everything to perfection, food, desserts, the settings, the house. (While working full time of course) By the time company came I felt like I had been through a marathon. After a few years I seriously dreaded the holidays, of course, no one in my family knew this. It was nice when the younger members of the family began hosting, and had way more sense than I did by asking people to bring a dish to their potluck Thanksgivings. We do potluck style with my mom’s family, too. It is great because we each get to eat many different things without having to spend all day (or two days) cooking. Plus, we can all make our specialties so we know it is good. And I get to eat stuff I don’t have often. Always heard it “many hands make light work”! Same idea! The turkey Frugal Found is sniffing looks delicious! We’re having a Chinese hotpot party at our house on Thursday. My husband’s friend bought a turkey, so we will cook that (cooking turkey for the very 1st time!). Other than that, we won’t do anything extravagant. Me too. A guest complained that our house didn’t feel like a house because we didn’t have any personal touches like wall decor or photos. I read this post right after I had breakfast and I’m already hungry again!! Looks amazing and great pictures! I will be having Thanksgiving with my 88 year old Mother who is still chugging along (and she cooks a bit too). And I’m grateful for that! Both our families live close so we will get to celebrate with both sides this year! And while I’m not a fan of the traditional Thanksgiving feast it is a very frugal meal to serve! Potatoes at 10 cents/pound?!?! We make an awesome paleo chocolate pie every year that’s nowhere near as healthy as it sounds! Whelp, it’s just after 8 in the morning and now I’m hungry for turkey and pie…thanks a lot Mrs. Frugalwoods! I love your emphasis on gratitude; it’s been something I’ve been trying to make a daily habit, too. Thanksgiving is a great reminder of just how good it feels to recognize all of the wonderful people and things in our life. Hopefully many of us can take away from Thanksgiving that the giving of thanks doesn’t need to be just a once-a-year tradition. It makes life better every day when you stop and remember how blessed you are. You are my absolute favorite blog. Thank you for all you contribute to my ongoing pursuit of simplicity, frugality and gratitude. 1. Have you tried those frozen Pillsbury biscuits? They are fabulous and after eating one, I burned my biscuit recipe. 2. Since turkeys are so inexpensive this time of year, are you at all tempted to buy one or two to cook, debone and freeze, etc. Thank you for your kind words! To answer your questions: 1) Yes! That’s what we buy :). 2) We don’t really like turkey all that much, so we’re not going to bother. Happy Thanksgiving to you too! 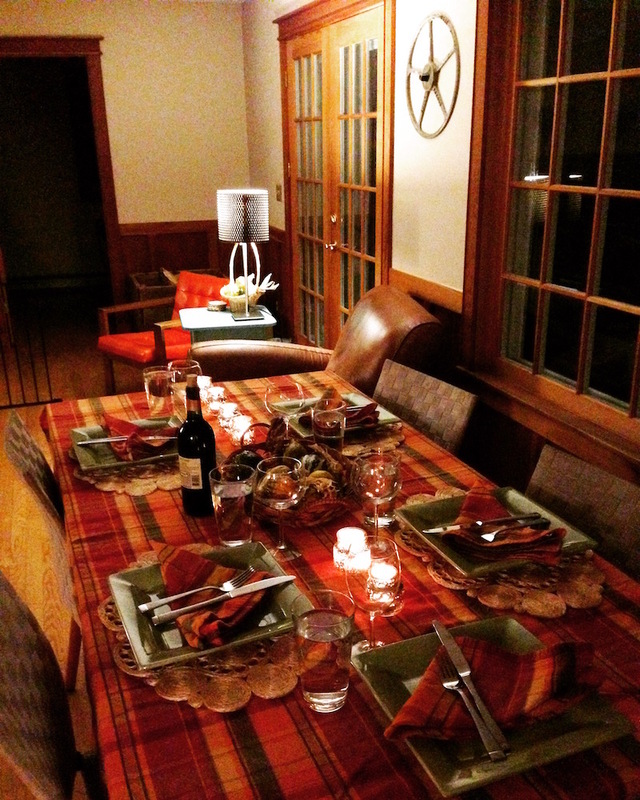 We loved our early Thanksgiving meal last weekend. Next weekend we will all visit our In-laws Thanksgivings far from our local homes. In as much as we LOVE our traditional Thanksgiving meals, we have decided to go with hot and cold appetizers for our Christmas afternoon meal this year. The hostess will do the hot appetizers and we will all bring the rest. It will be a less stressful day for everyone. Bring on the family visit and good food! I love this post. With rampant consumerism, it’s sometimes hard to see past the spending and the gifts at Christmas and other festivals. But it’s so true what you say about ‘the holidays are meant to be fun, to be filled with delight, and to leave you with warm, lasting memories’. That’s all that really matters and it’s certainly what I remember from my own childhood in a poorer but loving family. Also thanks for the delicious sounding recipe ideas, I will be looking them up and trying them out! I love eating non-traditional Thanksgiving food on Thanksgiving. In fact, I am not a fan of turkey. Every year, we cook up a huge ham for us an my dad. We eat on it for a couple of days, put lots of slices in the freezer, and boil the leftovers (bone and all) to make a stock for vegetable soup – it even has chunks of ham in it. I know I have been given much, evidenced by the fact that I am going to retire in 6 yeras at the age of 35. I recently decided to take a step back and determine everything I am thankful for, not just money. This helped me determine my motivation for becoming more frugal. I came to the conclusion that I have to remember to be thankful always, not just at the end of the year while overeating (which is bound to happen). I am absoutely going to try that pumpkin crisp recipe. It looks devine. I will probably have to make multiple as I will most likely eat a whole one by myself. We don’t have Thanksgiving here in South Africa, but I love the idea of it, and think my version of Easter is pretty similar. I know Easter is a religious holiday of course, but for us godless heathens, it’s a wonderful long weekend, involving no frantic gift-buying or terrible pressure, just around food, some chocolate eggs for the kids and that’s about it. There isn’t even a ”designated” menu. It’s generally somewhat traditional, so possibly a roast of some kind, but that’s it really, bar the hot cross buns (Mrs Frugalwoods, I’m not sure if you have these but they are amazing). Also, NB the very best way to handle leftover turkey that’s not really THAT much for a whole separate meal is to make shredded turkey, mayo AND CRANBERRY JELLY (just a bit, not a huge quantity) toasted sandwiches. You binge on these while slumped in front of whatever is on TV. DEELISH. Not that I am opposed to canned biscuits (delicious!) but I wanted to leave you with my favourite biscuit recipe – four ingredients and so fast to throw together. I skip the sifting and the whole shebang is ready to eat in 20 minutes. Happy Thanksgiving! Turn dough onto a floured surface, mound it into a ball and, using your hands, press it to a thickness of about 3/4 inch. Cut into rounds, 2 1/2 inches in diameter. Gather dough scraps and continue to make rounds. Arrange on the baking sheet. Bake until golden, 12 to 15 minutes. Serve immediately, or flash freeze for future use. I love this! We’re hosting Thanksgiving for the first time this year. I’m excited and nervous! We deliberately decided not to get crazy with all of the Thanksgiving sides and desserts and whatnot. I hate cooking all kinds of dishes for Thanksgiving that people don’t eat. We decided to do favorites to feed 15 people: two turkeys, a ham (for my turkey-hating side of the family! ), scalloped potatoes, green bean casserole, sweet potato casserole, and homemade pumpkin rolls. I’m making an artichoke goat cheese dip and keeping it in the crock pot so family can have a nice snack while we’re cooking. Mr. Picky Pincher’s family has a very nice Thanksgiving tradition. Before we eat, everyone goes around and says one thing they’re grateful for. At first I thought it was kinda cheesy, but it’s a nice way to remember that this holiday is about gratitude and family time. I’ve commented before on your shoofly pies! Love seeing it, as I also come from a long line of Pennsylvania Dutch family, and my Grandpa was actually a baker who specialized in shoofly pies. I love traditional shoofly pie, but this year I had a realization that I could add some spices and turn it into a Gingerbread Shoofly pie! I added ginger, cinnamon, cloves and nutmeg to the crumb mixture, and it is so so so good, if you ever want to try updating a classic. 🙂 I’m writing up the whole thing with a tribute to my Grandpa for my monthly food column in a local magazine this December. Sounds delicious! Although I might have a rebellion on my hands if I mess with the recipe… ;). Just an FYI- shoo fly pies freeze wonderfully. We have a family friend who makes them in bulk and has a freezer full ready to send off with her guests. She is justifiably famous for her baked goods and it is an honor to be sent home with a frozen shoo fly pie or funny cake. One Christmas my siblings and I asked our stepmom to make our two favorite dishes that she cooks – chicken spaghetti and sinful cheesy potatoes. Traditional? No. But it was delicious and my stepmom was so happy to make us what we really wanted. She passed away a few years later and I still remember that Christmas! Oh, I can smell the holiday while reading your beautiful post. Eating leftovers? I agree absolutely. I spent the money and time on it, and got to eat all as long as it’s not spoiled. For the big turkey leftover, bag it separately, freeze it, and eat it later. Thanksgiving is about family and friends getting together, having a great time, and giving thanks to our blessings. It’s not about shopping. Shopping should be the next day, Black Friday. Unfortunately now the Friday becomes Thursday in US. I just wrote a new post “Do you go shopping on Black Friday?” in my blog to talk about this issue. I wish everyone a great Thanksgiving! Your language of “frugal takeout” to describe leftovers has honestly changed my perspective. I used to be someone who grudgingly ate leftovers (with the exception of Thai food, which I could eat every day of my life and be happy). Now thanks to you I’ve come to adore leftovers as reducing effort and cost – and now we have almost no food waste as well. Really life changing switch of perspective. We do Thanksgiving at one of my brother’s house. My parents have the longest drives, each driving about 2 hours (from opposite directions lol). I have 4 siblings coming from different areas. I usually provide the turkey because my boyfriend gets a free one from work every year. And then everyone pitches in with sides, desserts and drinks. My mom used to always host it, but she would end up spending hours making all the food mostly herself plus clean up. Now that my kids are getting older, we end up with about 8-11 adults, a teenager or two, and 3 or more smaller kids. So, it’s a lot of food! Splitting the labor and costs has helped Mom enjoy the holiday more. For Christmas, my 3 kids & I always celebrate at my house. A couple years ago, due to crazy work schedules and exhaustion from travelling, I decided to fix appetizers (mostly frozen but some homemade) and finger foods for dinner on Christmas Day, then I made the full-blown traditional turkey dinner the following weekend. I thought I would get a lot of resistance, but everyone loved it and it became an instant tradition. Now, they start making their appetizer requests months ahead of time. I wish I had started this when they were young. Then I could have spent Christmas playing with the kids and watching movies instead of slaving in the kitchen all day. I’m sure I spend more money this way, but it is sooooo worth it. I LOVE appetizers for dinner!! We’ve done that for Christmas a number of times and it’s such a hit–plus, so much less work :). Happy Thanksgiving! Also, I love your blog for many reasons, but as a fellow Vermonter it makes it even better to follow along! Ok, ok, I will have to check out that recipe since it’s a King Arthur Flour… although for this year, the canned biscuits are already in the fridge ;)! This year for the first time, we are in our Florida home and away from family. I have always loved Thanksgiving because it is a stress-free holiday for me — simply get together with family and eat good food. That sort of changed when we chose a plant-based lifestyle. Suddenly it became stressful to accommodate us. I am excited this year, although I will be missing family, to cook for us a strictly plant-based meal. This is something I have been wanting to do for the last few years. Our new tradition is to adopt a turkey from a sanctuary and this year we did from Farm Sanctuary in NY. I will be making personal lentil loafs with mushroom and sage, hasselback potatoes with kale pesto, brussel sprouts with cranberry and pear, and crustless pumpkin pie with pecan streusel topping. I am excited to cook delicious, healthy food and savor the flavors with my husband and best friend. If all turns out well I will be serving it again for Christmas dinner with my sister and her husband who also decided to choose a plant-based lifestyle which is such a relief when we get together. (I hope she won’t read this because I’m keeping the menu a surprise!) I guess the message here is that food is stressful – so many tastes and choices. It can bring people together but also keep them apart. We do not preach our lifestyle or try to push it onto others in any way, but there is always some sort of “pressure” to eat meat. We seem to always be the elephant in the room. I am so grateful for my plant-based lifestyle. 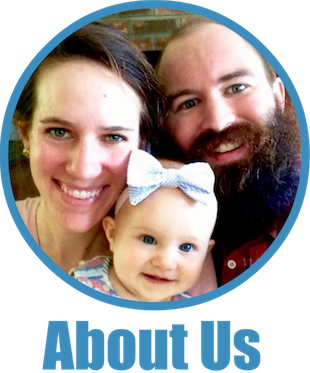 It has made a large difference in my life in a positive way and I am saddened that it has affected our family time, but I am also grateful for a wonderful family whom I will miss. I love FaceTime. Thank you for this comment. I am a vegetarian and like you don’t push it on anyone. One year we had Thanksgiving on the beach, it was amazing. Along with all the trimmings, we had both turkey and I had vegetarian “Thanksgiving” loaf. I was amazed that my big strapping nephews loved the loaf more than the Turkey, they had seconds and thirds. I love your menu! If you have time can you post the recipes. Thank you! I love your gentle description ‘plant-based lifestyle’. ‘Vegan’ is such a loaded term, which comes with all sorts of frightening baggage, regardless of how sensitively it is used. I am working towards this goal, and am amazed at how much more I’m enjoying cooking and eating (as well as its effect on my budget)! I’d like to imagine an ideal get-together in which there were options for all comers (with no preaching or judgement by or to anyone for their choices). Having escaped from a seriously dysfunctional family, I won’t hold my breath – although Karole’s reply to you gives me hope. In honour of your Thanksgiving tradition, I will instead test a recipe I found for biscuits made with coconut cream (to figure out why you Americans are raving about this food which doesn’t exist downunder). Can I eat that with my Chickpea Curry, d’you think? Try Korintje cinnamon in the cinnamon buns. They’ll taste like Cinnabon! 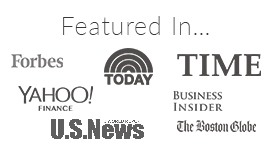 You won’t find it in stores, but Amazon has it. My Thanksgiving is not frugal. I celebrate it with joy and love. We have traditional foods except for the turkey-we are all vegetarian. I love to cook and bake so this is a fun time for me. I am frugal in my every day life but celebrate on holidays such as Thanksgiving and Christmas with a feast. Our gathering is our immediate family only as we decided my toxic family needed to be removed from our lives. It wasn’t an easy decision but my, our holidays are filled with joy and love now. We also make it a point to share what we have been thankful for during the year and praise God for His love and kindness. And the leftovers are a wonderful thing to have as everyone stays thru Sunday! Thanks – great reminder about practicing daily gratitude! I love a meal of basically all your favorite sides and apps and desserts. Your main dish stuffing reminds me of ours… my mom’s side of the family (French Canadian ancestry) does something similar, but no bread…. we use roughly mashed potatoes. So it’s basically a hash… potato, onion, ground beef, ground sage sausage, and a TON of sage…. mix in a little turkey gravy for extra flavor. We make a double recipe specifically for leftovers and freezing. Heat it up in pan to drive out any extra moisture and top with a poached egg. Such a great post, Mrs. Frugalwoods! The holidays should be about the things we love, not about unnecessarily adding extra stress in our lives! We stopped buying a turkey for Thanksgiving several years ago – we don’t even like turkey so we were literally getting it “just because that’s what people do”. We always ended up with a ton of leftovers that I would stick in the freezer, and proceed to put out of my mind for months until finally tossing it. I tried making different things with the leftovers but we just truly don’t like the taste of turkey. We have been making a ham instead and we all love it – I use the leftovers in all kinds of recipes and even use the bone to make ham and bean soup. Yum! Thank you, thank you for the recipes!!! If you have friends who don’t want to deal with the turkey carcass and you offer to pick it up and get it out of their kitchen you can have a wealth of broth making bones and honestly quite a bit of meat scraps left. Use your pressure cooker if you have one to speed the process or just load the spaghetti pot with bones, water and just about anything else, put the stove on simmer and walk away. Happy Thanksgiving Liz and frugal nation! Am I the only one who can’t see the pictures of the food? 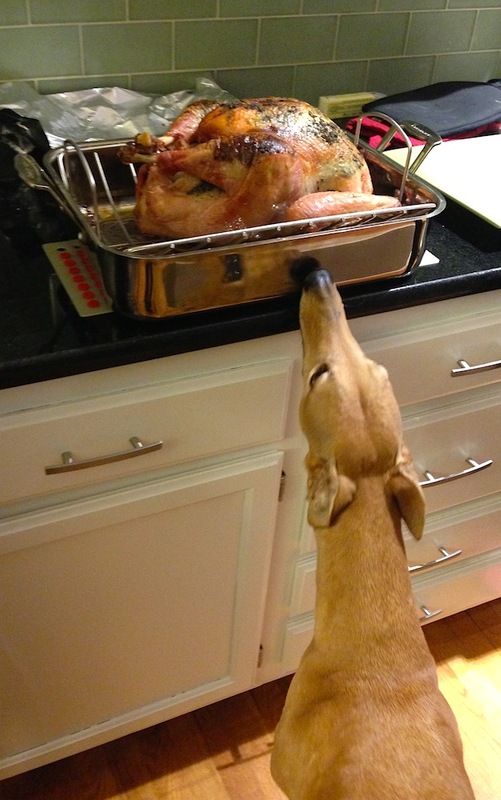 I can see Frugal hound sniffing the turkey but the other photos are just a grey block with your description. With only 40 days left in the year I am on a diet so not looking at pictures of food is probably a good thing. Have you ever heard of Murkey? It’s “mock turkey”- basically sausage stuffing wrapped in bacon for the body, with parsnips on either side for the legs. People made it during WWII due to rationing restrictions on meat. Never heard of it, but COOL! I will look for a recipe, or do you have one? I have lots of old cookbooks. I think my husband and i would like this! And it’s pretty unique! Never have I ever understood not liking leftovers ! They are the best . Regarding your frozen pie crusts , I just saw that Cook’s Illustrated rates Pillsbury’s ready rollout refrigerated crusts very highly . Our community hall in the canyon hosts a Thanksgiving potluck every year. The hall coordinates the turkeys, potatoes and gravy, and everyone brings a side dish or dessert. Nice to have dinner with friends when we are not traveling out-of-state to be with family. Last year, I brought mashed sweet potatoes (sweet and salty with maple syrup and sour cream)…I am looking in my pantry to decide what I will put together this year! We’re spending our Thanksgiving doing taxes (FUN! Not!) and maybe eating out at some Mexican restaurant. I love food at Thanksgiving but restaurants here don’t bust out any specials and we’re too busy to make things from scratch. Everything is go-go-go here. I never heard of a shoo…fly..pie? My husband is part Dutch too but he’s as Americans as apple pie haha. 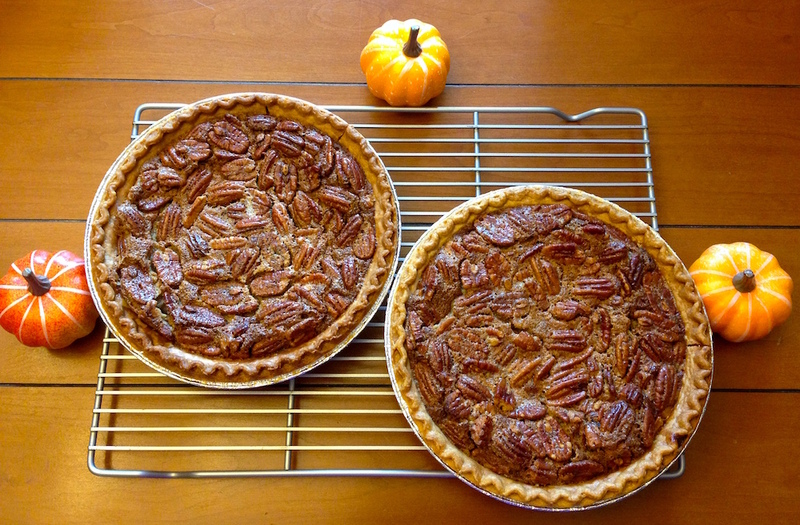 Your pecan pies look AMAZING!! Shoo fly pie is Pennsylvania Dutch (actually Germans) – I’m about 1/8 Pennsylvania Dutch. It’s called that because it’s so sweet and sticky you have to “shoo” the flies away. Another great – and funny! – post. This year it’s my husband, our two grown children and two dogs (rescues who appreciate everything!). I’m taking the bold step of cooking a 7 pound turkey breast in my InstantPot. I cheat on the pies – Mrs. Smith’s are inexpensive and taste just fine. I do take the time to make my dressing from scratch and as it’s baked in a casserole dish I can’t call it “stuffing”. My kids prefer pillsbury’s crescent rolls to anything homemade. No one but me likes mashed potatoes or green bean casserole so I’m trying whipped sweet potatoes this year. One tradition is to go to a morning movie matinee – this year’s it’s “Coco”. We eat later than most folks – about 5:00. We potluck Thanksgiving. With an extended family of 20+, especially when we add in any visitors or strays needing a family for this all important holiday- one or two people cooking for that many is impractical. We rotate hosting and the host’s job is to cook the turkey and provide beverages. 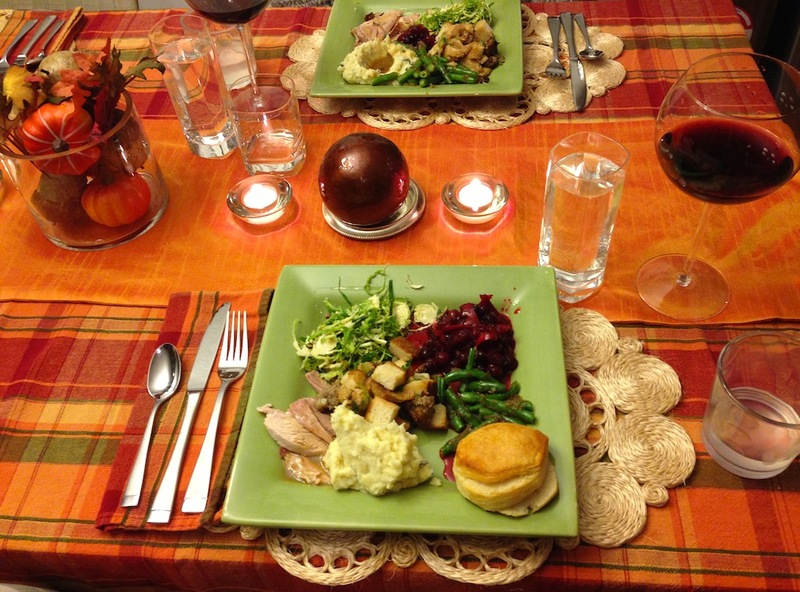 All other guests/households are expected to contribute the rest, each bringing a dish to share. We don’t coordinate, that’s a bit too much effort. Some years we end up with turkey and 17 desserts and others 4 different types of yams. But, it’s fun to taste the dishes and traditions from other families, and it’s way, way less work for the host. Everyone has enough to eat, we drink tons of wine, everyone feels included and no one is super stressed out about trying to provide a perfect meal. While we also do the traditional Thanksgiving Day spread with either my or my husband’s family, we’ve also started a tradition of doing a Friendsgiving the Saturday before the actual holiday every year. To keep it simple, I assign each couple/individual who is coming to bring one or two sides, which means that I only do the turkey, gravy, punch, and rolls. To keep stress down lower, I always roast the turkey overnight in the oven the night before (and it takes all night to slow roast in the oven), then we slice it up in the morning and put it all in a casserole dish to be reheated just before guests arrive. It’s the best way I know of to make sure I’m not stressing out, since the biggest part of the meal is done by about 8 in the morning on the day of! Thank you for another brilliant article. I wish I could get my family to celebrate Christmas in January, it makes so much sense especially for those coming from the East Coast or vice versa. And it would still be Christmas, after all in some parts of the world orthodox Christmas is celebrated January 7. 🙂 Also, I am glad you pointed out the “sin” of throwing out food (i.e. bad for our already ailing environment, and it shows a lack of appreciation and understanding of all the work, sacrifice that goes into it — most of us are far removed from the process of how food gets from the farm to the grocery store. We promiscuously consume it, toss it without a thought (let alone a thought about the animals that suffer horribly for our tastebuds sake, but that’s another topic. Let us all say a prayer of gratitude this Thanksgiving, blessed food is good for you too! My family moves christmas whenever its convenient for us. mostly we celebrate on boxing day. But one year my uncle had been in london for months and came back in feb – so we celebrated then. 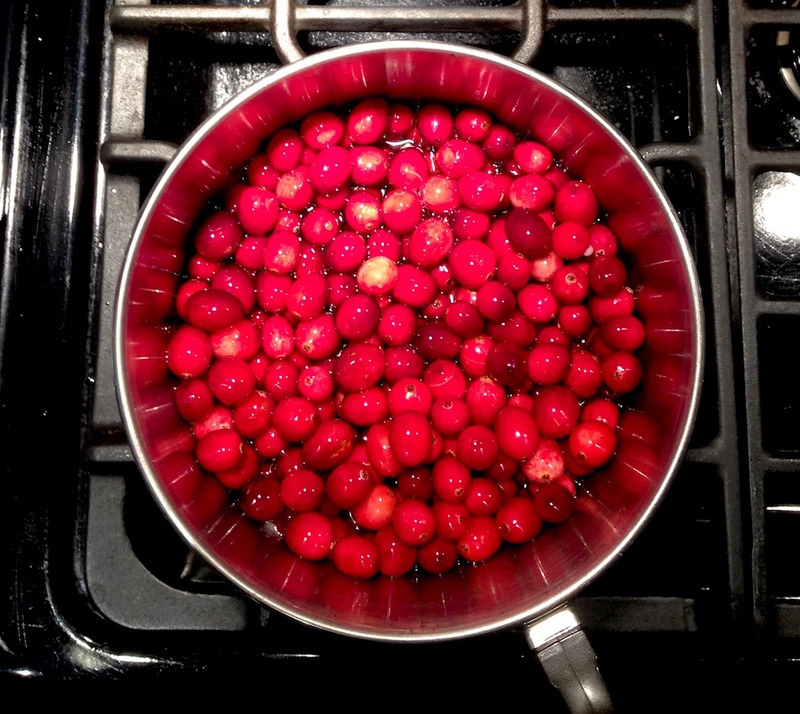 I always make the homemade cranberries. It’s so easy and they are pretty healthy. Because I don’t eat meat, Thanksgiving looks a little different for me. Each year I’m invited to my daughter’s in-laws, and they make between traditional meal, and I take the meatless dish. This year I’m making a mushroom –pecan Wellington. My mom makes a ton of pies throughout the year and most definitely uses pre-made, rolled up pie crusts (most of her pies have a crumble on top instead of another crust). Considering the monumental effort she puts into making food for family gatherings (guess which family member I got my perfectionist tendencies from! ), I’m glad she’s compromised on this point. Making your own crust is way too much effort for something that doesn’t add much to the taste of the pie anyway! Ahhhhh thank you for all the links to new recipes-I’m going to go check all of them out. Happy Thanksgiving! But try ti a few non-holiday times! My mom makes the flakiest, buttery pie crust that melts in your mouth! When I grew up and tried a store bought pie for the first time I was really surprised at how different it tasted. My mom certainly had spoiled us with homemade pies. My family makes a VERY similar stuffing. However we add cubed apples! You should it out – it balances out well with all the other flavours! and turkey fried rice. I need a bigger turkey. Our families live in other areas of the country, so we’re spending our Thanksgiving here in our town with good friends. Everyone will bring something for the spread (being vegan, I’m contributing veggie chili, salad, and WINE, of course!) and we’ll enjoy an afternoon together. Left to our own devices, our Thanksgiving meal tends to be super simple. In the past, we’ve had chili, salad, bread, and alcoholic beverages as our Thanksgiving meal. Also… Is that a Brussels sprout salad in one of the images above? If so, do you have a recipe? I LOVE Brussels sprouts. One of my cousins once hosted a Thanksgiving pajama party. Everyone, adults and children, came in their favorite jammies. Brilliant! I love the meditation on gratitude and privilege. I’ve been thinking about that a lot lately too. I live in an area with a huge homeless population and it makes me so sad when I see so many people living on the streets while I have a nice house to go home to and plenty to eat. I don’t think I’m any more “deserving” than the homeless are, so why am I able to have so much while they have so little? Best part: you can freeze some for the future. They don’t plump up as much, in my experience, when they’ve been frozen. However, they’re still super tasty and flaky. I have a hard time finding the difference between these and the ones from a can, except that these taste a bit better. Also, toddlers have a lot of fun cutting out the biscuits and arranging them on the pan to be either frozen or baked! Asian spicy vinegar potatoes, courtesy of my Asian sister-in-law. We adore them. It’s a wonder we can move afterward. I love Thanksgiving, and can’t wait for tomorrow! Love the article especially the importance of leftovers. “You know what the most expensive food you can buy is?” My dad always used to ask me, “Food you throw away.” Not only is it a waste of money but we also feel less grateful for the animal that was sacrificed (meat) when leftovers are throw out. We made a turkey the week before Thanksgiving because it was on sale for a good price and were able to get a total of 20 meals out of a 20lb bird. Also like using bread that is about to go bad for stuffing and other casseroles during the holidays. We’re full time rvers. I never know where we will be on any holiday. Sometimes we’re with family. This year we’re in the Rio Grande Valley, Mission Texas to be precise and our resort always supplies the turkey and table mates supply the sides. I’m vegan so I brought potatoes knowing I’d have something to eat. My friends and husband eat meat so my Mr was happy. Dining with three other couples can add variety with the dishes shared! And they managed to fix dishes to share with me. We’ve already made plans for Christmas dinner…a picnic on the beach, just like last year.